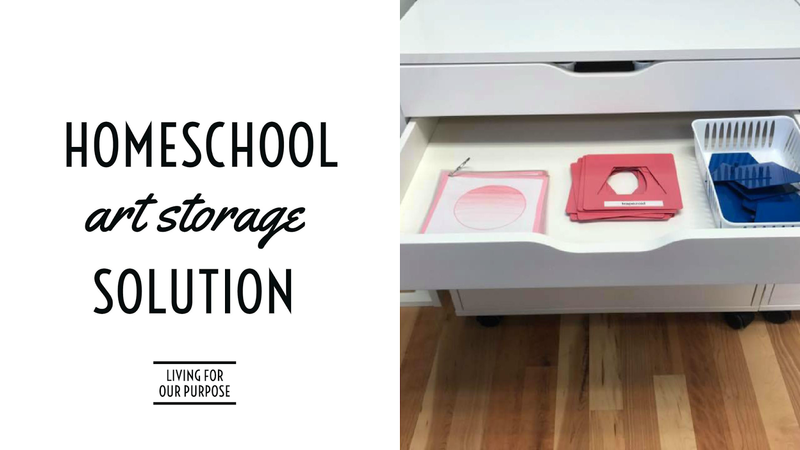 This is the first post in our homeschool room tour. The area we are focusing on is Art. This was once my most dreaded area in the whole room. 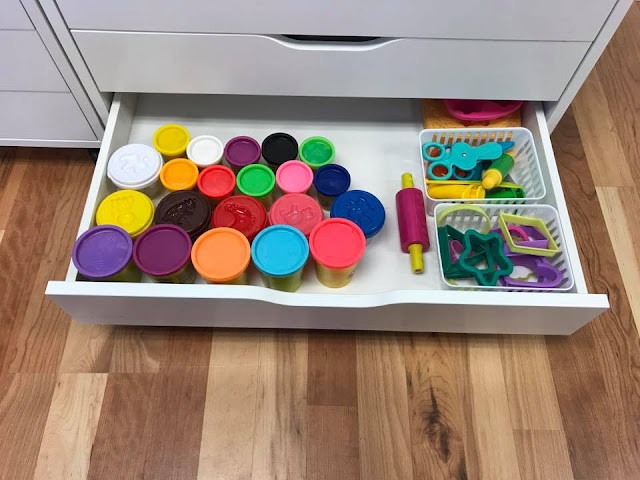 Before it was unorganized, cluttered and was not easily available for independent work. My daughter would have to get me to reach up on a high shelf into a large bin to take things out. This area now has exploded her creativity and writing skills. 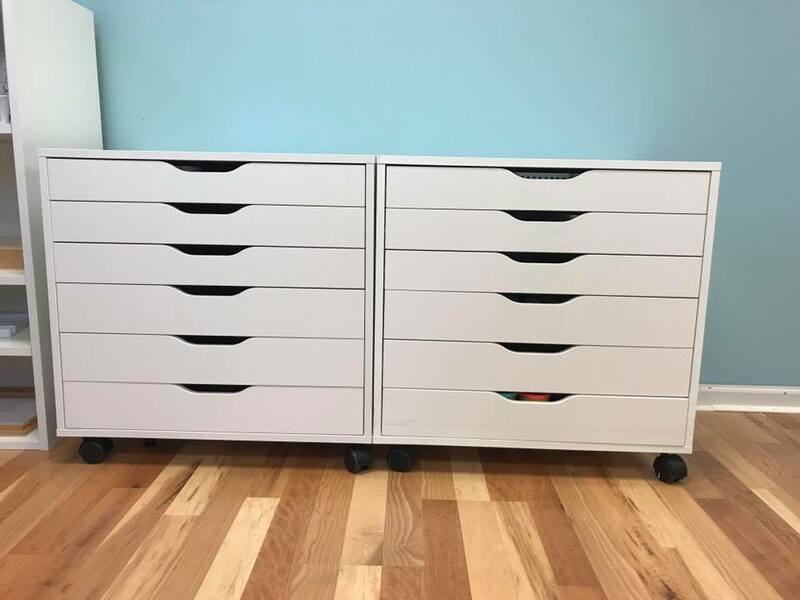 We purchased 2 of the white Alex units from IKEA. Inside you will find some Montessori materials and art supplies. Review- I love the height of them. Perfect for my 4 year old to stand up and work on top of for extra table work space. They move around easily with the rollers and the back is finished. 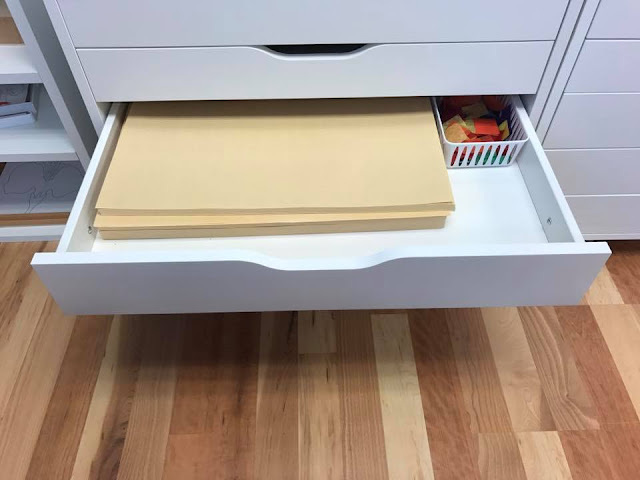 The drawers are wide and deep to keep everything organized. It is very easy to wipe down to get clean if there are any spills. Who doesn't love the look of white furniture? Each of the units is dedicated to a specific need. Let's take a closer look to what's inside of the drawers of the writing unit first. Inside the first drawer is a wooden metal inset tray, a wooden metal inset paper holder with paper, a basket of colored pencils and sharpener, and a basket of twist-able colored pencils. 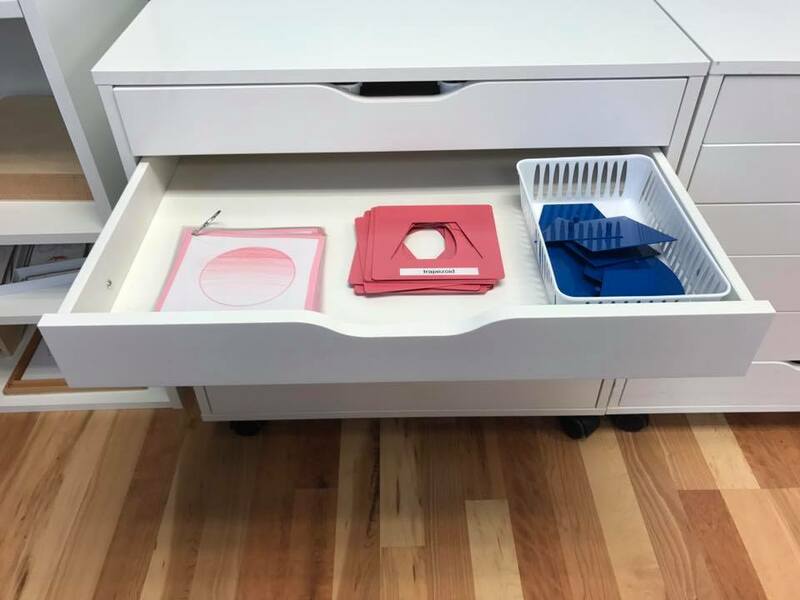 The second drawer has a ringed booklet of metal inset examples, labeled outline metal insets, and a basket of the inside of the metal insets. 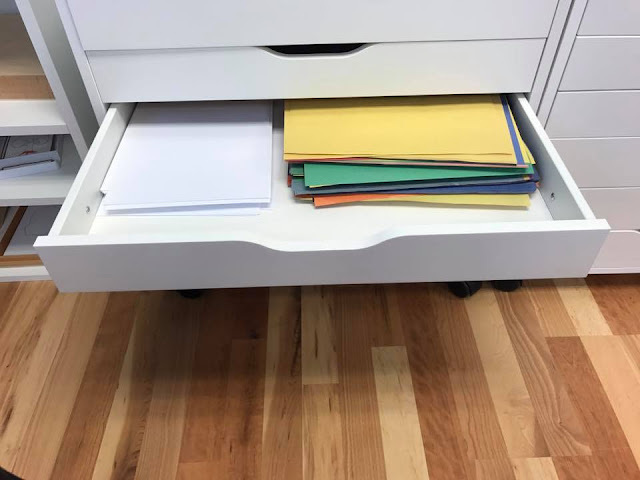 The third drawer has stacks of plain white 8 x 11 paper and colored 8 x 10 construction paper. The fourth drawer has a stack of manilla 12 x 18 paper and a basket of square tissue paper. 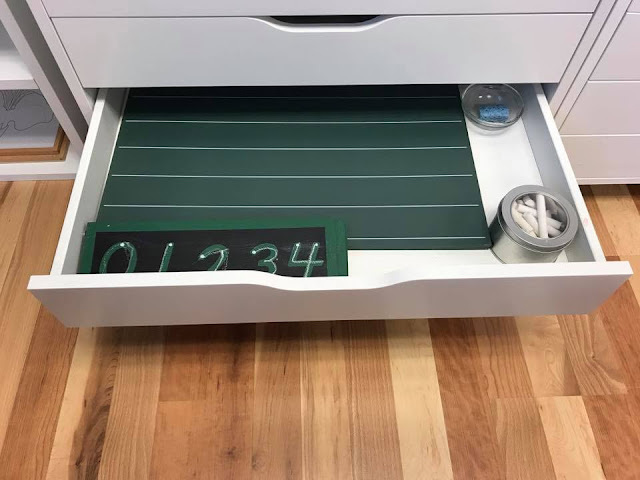 The fifth drawer has 2 greenboards, one lined and the other squares. Dish with a small sponge and a metal container of white chalk. 0-9 number chalk board, name chalk board, and blank boards. 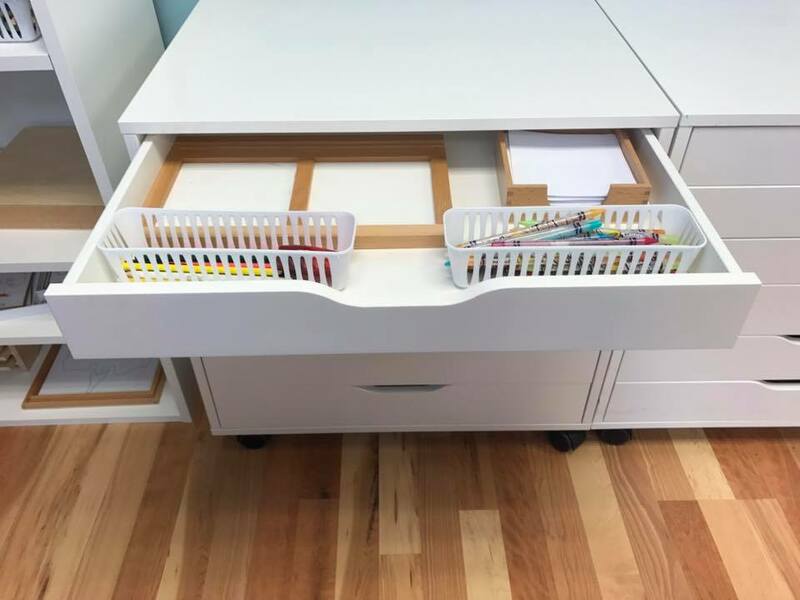 The sixth drawer has a white dry erase board, basket of assortment of dry eraser markets, wipes, and small sticker books. 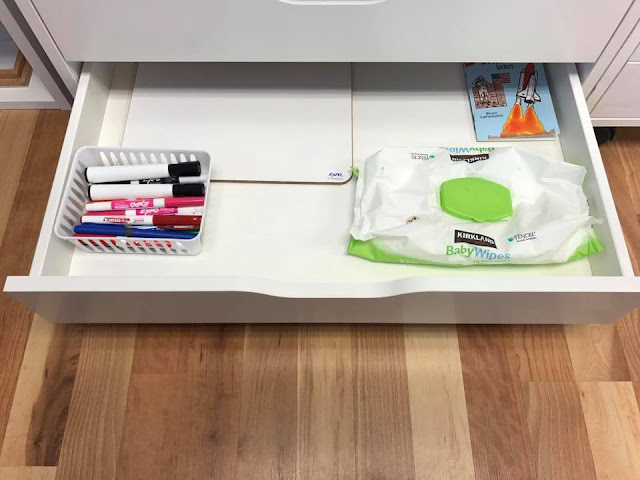 Now let's take a look inside of the drawers of the artwork unit now. The first drawer has a wooden ruler, tape with dispenser, large 2" circle punch, heart punch, a basket with small thin markers, basket of small punches, a basket of scissors, a basket of tape, basket of twist-able crayons, and a basket of glues. 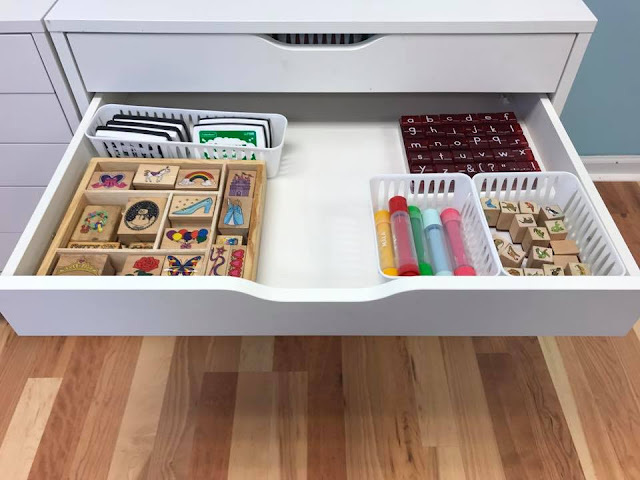 The second drawer has a basket of colored ink pads, an assortment of wooden stamps, alphabet stamps with punctuation, a basket of stamp markers and a basket of small animal stamps. The third drawer has an assortment of do-dot markets and water color sets. 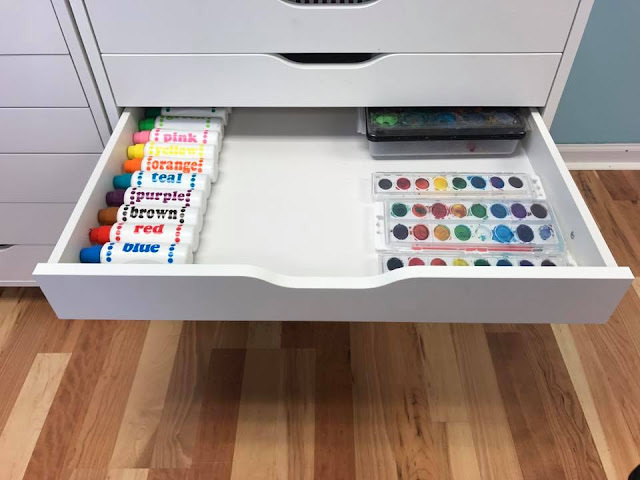 The fourth drawer has a couple large red easel clips, fingerpaints, wipes, a basket of different style brushes and lots of colored washable paint. 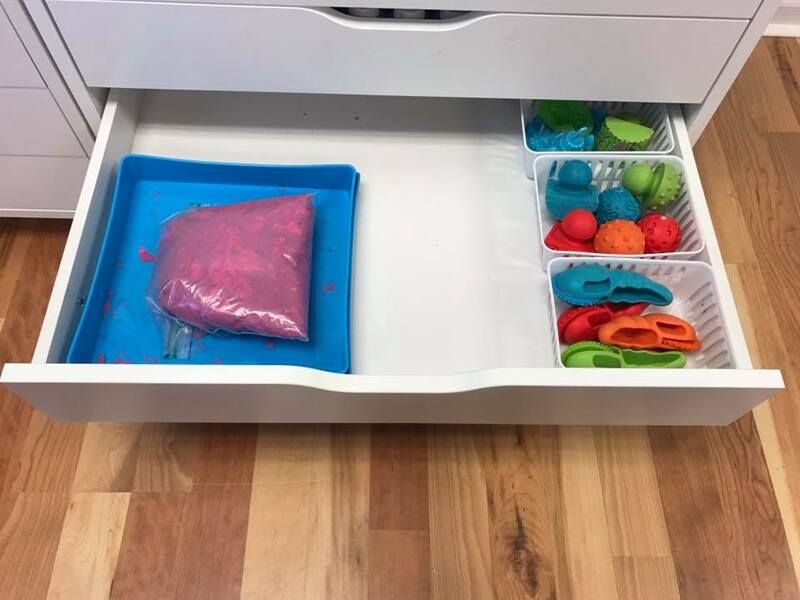 The fifth drawer has an assortment of colored playdough, a basket of shapes, a basket of tools, and a tray for making playdough cupcakes. The sixth drawer has a tray for the kinetic sand, a ziploc bag of kinetic sand, and 3 baskets of easy to grip clay and dough tools. 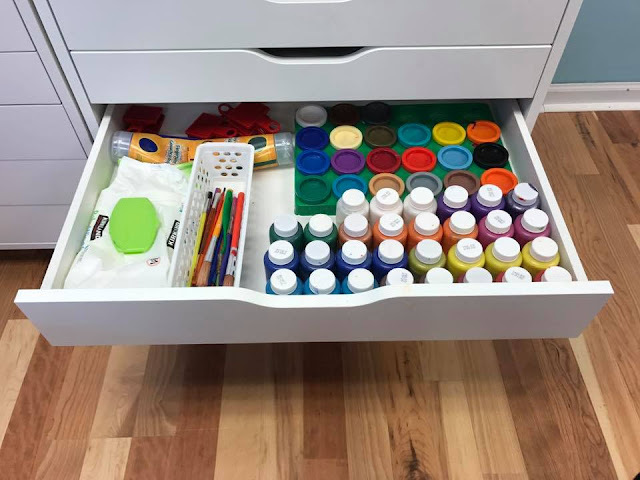 How do you store and organize your art supplies at home? 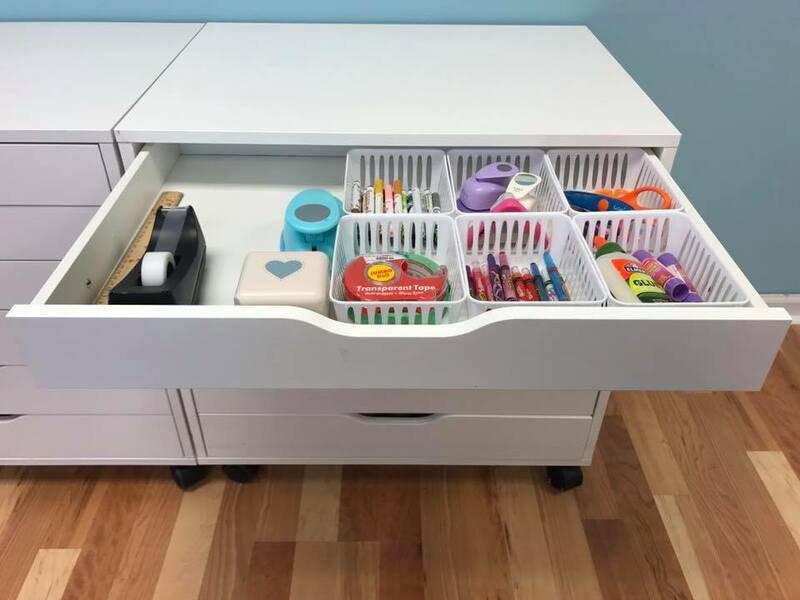 Comment below if you want to know more about the items in the drawers.